Create a Team of Superheroes! Start a company or school team and enjoy extra savings on registration! Flat rate of $30 per person through March 15th by 5:00 pm. Includes children, youth, adults, chip-timing for runners and larger shirt sizes. Upon receipt of payment ($450 or more), your group will be set up with a special code for team members to register. Already Have a Justice League Team? You can add team to your team in groups of 5 or more. To purchase a Justice League Package, please contact NFAR . For questions, please call us at 858-679-8800 . 1. Invite Three other awesome friends to join your team and share this experience with you. 2. Use the on-line tools to invite people to join your team, and raise funds. 3. To help you Build a Team, you can print Race posters (see Race materials page) or we will send you Race posters and postcards you can use to invite others. Contact us at info@nfar.org. Would you like some Sponsor posters mailed to you? Contact us at 858-679-8800 or email us. Would you like some postcards and/or posters mailed to you? Reach out to others in the Community – where you work, grocery shop, work-out, and where your child goes to school. Building a caring community starts with awareness. 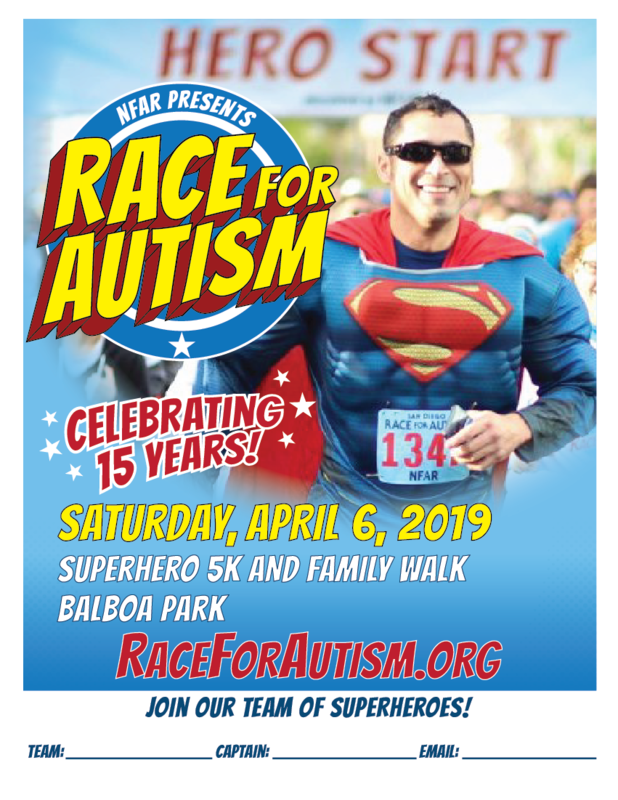 Let them know that everyone can participate in the Race for Autism and support this cause! 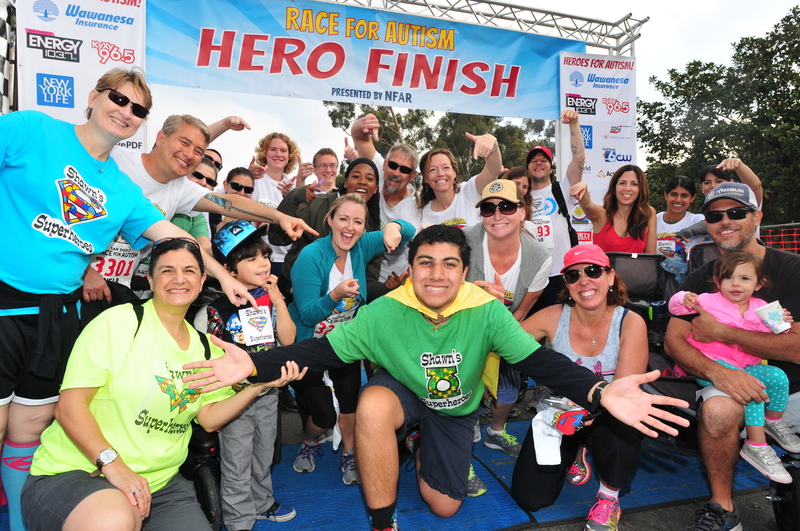 Many Companies are willing to Sponsor or Donate to a cause that an employee cares about. 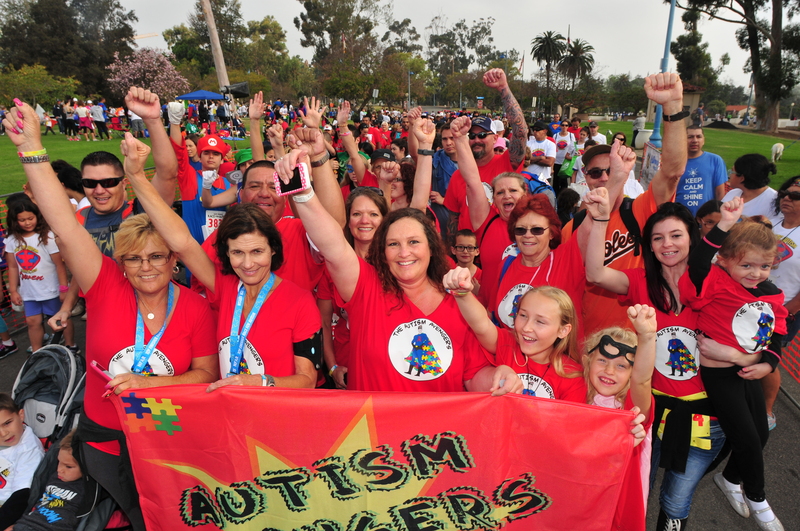 Ask your employer to be a Sponsor of the Race for Autism. We'll provide you with all the materials. Please call us at 858-679-8800. **Matching Funds** - DOUBLE your donations! Ask your employer if they have a matching gift programs. It's simple and an easy way to double your impact. RAISE FUNDS - Check Out Our Fundraising Tips! Every dollar raised makes a big difference in the number of autism programs and opportunities we are able to support in our community. We have fundraising tips and resources to help get you started. Please use the online tools to raise funds and enter any donations collected directly by you. They will appear on your donor roll. You can also use the paper forms or a combination. Checks should be made out to "NFAR". Please be sure to include your name with donations mailed in so we may add them to your fundraising total.